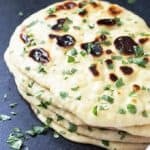 I have this crazy obsession with naan and finally took a leap of faith and made this amazing Homemade Naan for the very first time. It’s a LOT more economical than buying it in the deli and not as difficult to make as you would think! 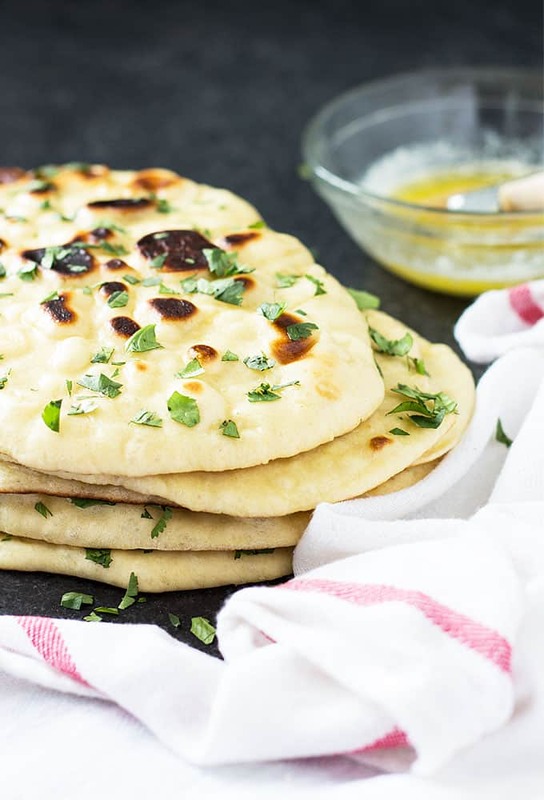 Soft, warm, puffy and buttery naan is so good to me! 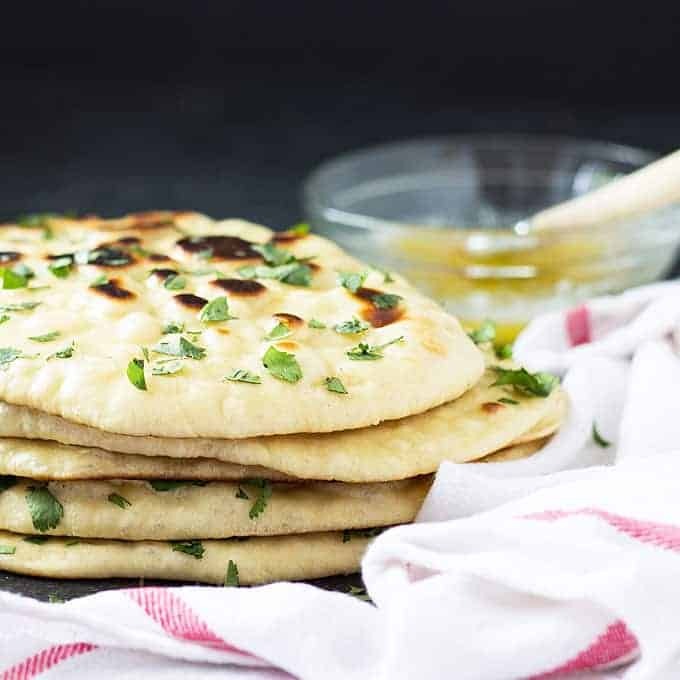 I love to use it as a flatbread pizza crust, but it can also be used as a wrap or simply eaten by itself. I don’t know why I was so afraid of making it. 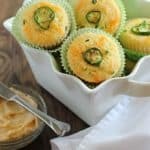 I searched around the internet and found 3 sources (credited at bottom of recipe) and took a little from each recipe that I thought would work for what I wanted. It turned out perfect, and if you follow these simple instructions, you shouldn’t go wrong. This is the dough that I kneaded for about 4-5 minutes getting ready to go into a large bowl that I coated with olive oil. You’ll need a much larger bowl than the dough because it will double in size after it sits for a couple of hours. After a couple of hours of rising in the bowl that I covered with a damp towel, here’s my dough all puffy and ready! On a floured surface, I rolled the dough into a rectangle and sliced it into 6 equal sections. I took each section and rolled it into a ball, then used a rolling pin to roll into an oval shape about 1/8 inch thick. 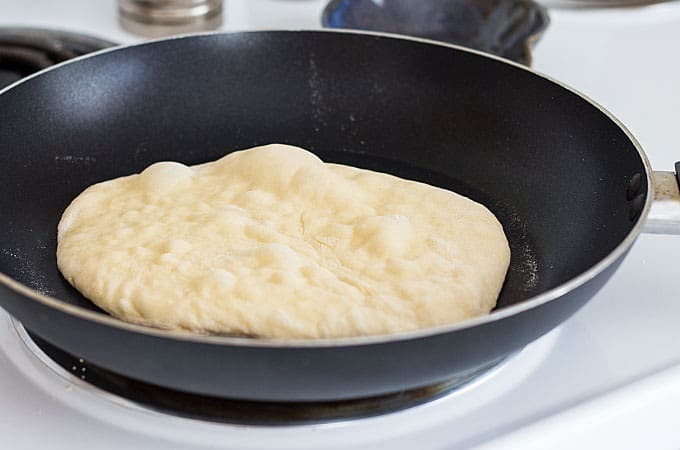 I place each flattened piece of dough in a skillet over medium heat. After about 3 minutes I saw these bubbles and knew it was time to flip the bread and cooked for about another 2 minutes. 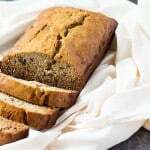 The bread should be golden and blackened in spots. Brush with melted butter after removing from the skillet and top with chopped fresh cilantro, if desired. This was so much easier than I thought! Another great thing I love about naan bread is that it freezes well. Since I live alone it’s nice to be able to grab one out of the freezer to use for a quick pizza. I wrap them individually in plastic wrap and store them in a freezer bag. 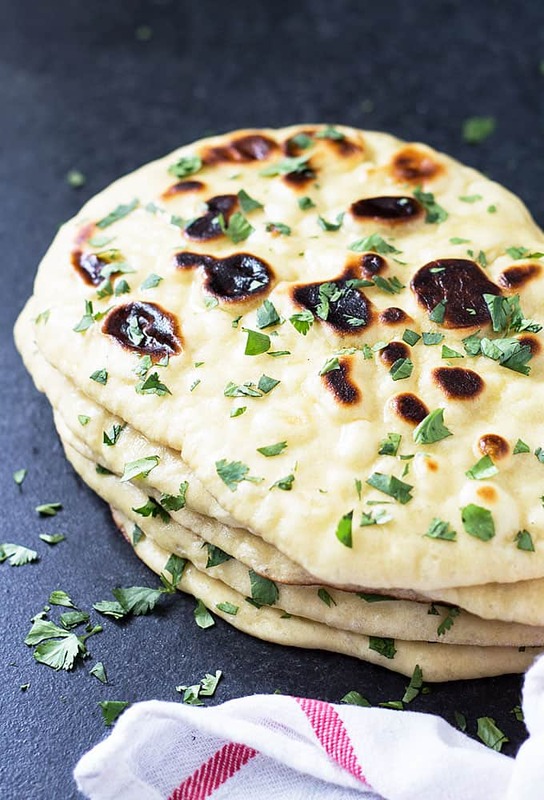 Need inspiration for pizza using naan flatbread? 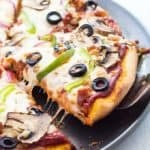 Check out my Naan Cheeseburger Pizza, BLT Caesar Flatbread Pizza, and Spring Harvest Pizza! In a large bowl, place the yeast in warm water. Stir to dissolve and let sit for about 10 minutes or until frothy. Once frothy, Add sugar, milk, egg, salt and flour. Stir to combine, making a soft dough. Add more flour if necessary. 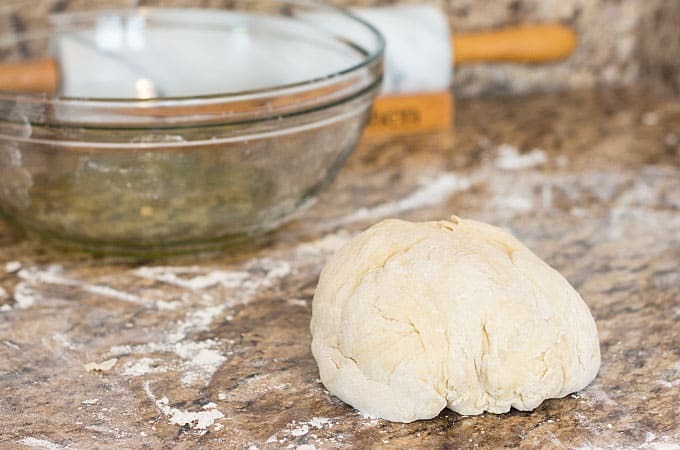 Place dough on a surface dusted with flour and knead for about 4-5 minutes or until smooth. Place in a large bowl that has been coated with oil and cover with a damp towel or plastic wrap. Let sit in a warm spot for 1-1/2 to 2 hours, or until doubled in size (the warmer the spot, the faster dough will rise). 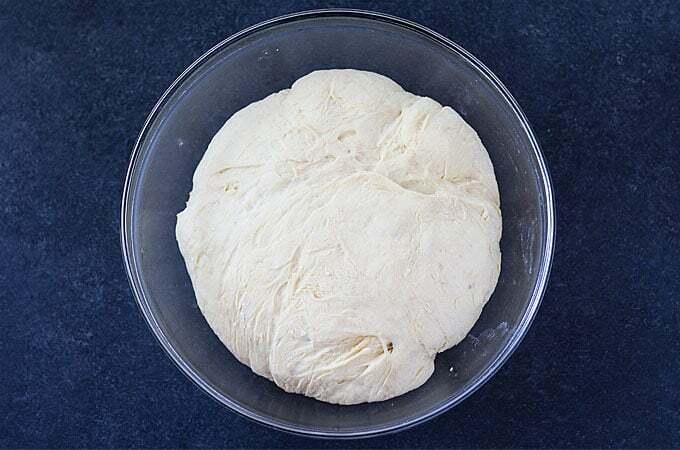 Once dough has doubled in size, place on a surface dusted with flour. 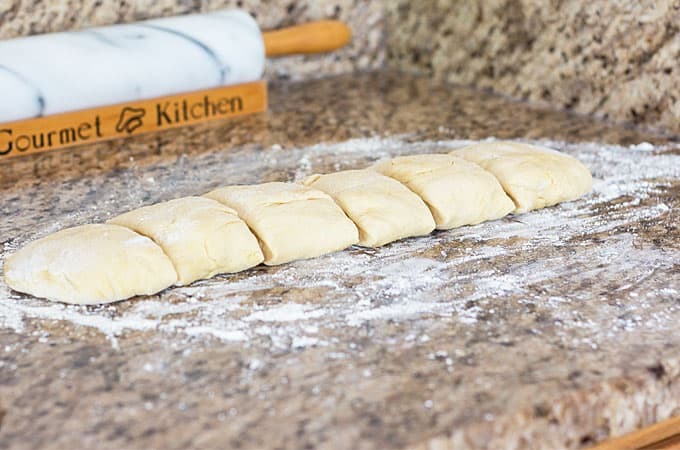 Form dough into a rectangle and slice in 6 equal portions. 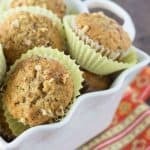 Form each portion into a round ball. 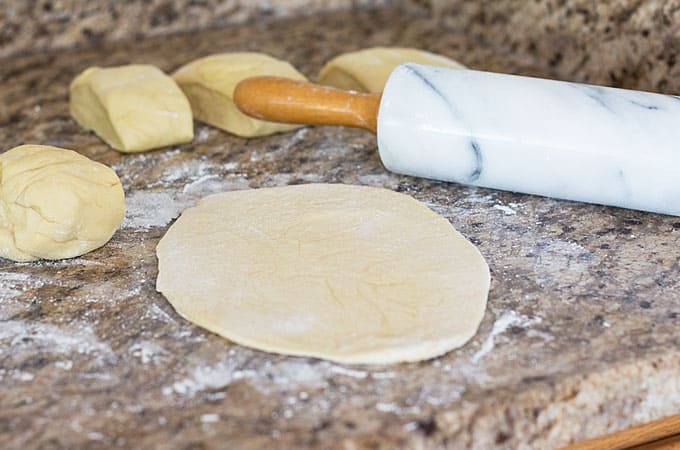 Using a rolling pin, roll each ball of dough into an oval shape about 1/8-inch thick. Heat a large skillet over medium heat. 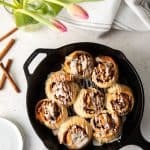 Once skillet is hot, place dough in the dry skillet and cook for about 3 minutes, or until the top has several air bubbles and the bottom is golden and blackened in areas. Flip the dough and cook an additional 1-1/2 to 2 minutes, or until bubbled areas are golden and blackened. Repeat with the remaining naans. 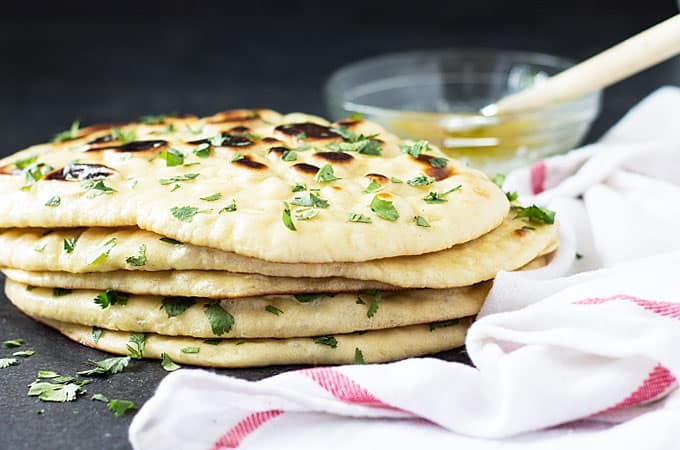 Brush naans with melted butter and top with fresh chopped cilantro, if desired. A special thanks to AllRecipes, Once Upon a Chefand Budget Bytes for inspiring this recipe!